Once again G-LO ventured out to the mailbox and brought in his most recent bit of boozemail. 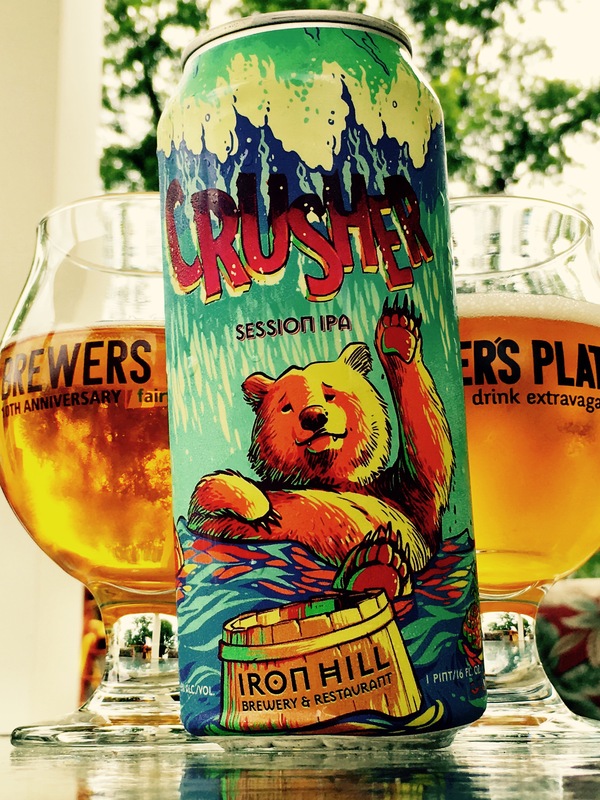 The fine folks at Iron Hill had gifted him their most recent canned creation, the Crusher Session IPA. Shortly after mail call, he saw me outside watching the urchins and noticed that I looked a bit thirsty. Always a generous sort, he sought to remedy my thirst and proposed a joint review. Sort of like drowning two birds with one stone…er, well, something like that. Anyway, he ventured over and brought his lovely new can with him. Iron Hill Brewery & Restaurant, the dream of Kevin Finn, Mark Edelson and Kevin Davies, opened their first brewpub in Newark, Delaware in November 1996. In the two decades since, they have added additional locations in Pennsylvania, New Jersey and Delaware, and filled their trophy case with rave reviews and recognition for their well-crafted and award winning beers. I was fortunate enough to attend the first pour at their Voorhees location and have been a big fan ever since. This approachable beer will be available in 16-oz. cans at all Iron Hill locations, and is a relatively low ABV IPA perfect for warm-weather sipping. Crusher is brewed with a blend of Cascade, Amarillo, and Nelson Sauvin hops, for bright aromas of grapefruit, peach and ripe pineapple; at 5% ABV, it is light enough to enjoy all summer long but still packs the flavorful punch of more potent IPAs. Appearance: Pale orange color (a bit like orange blossom honey) with minimal head and lacing. Limpd: A little malty with some citrus (I got apricots and not the grapefruit, peach and pineapple thing) and a mild, hoppy tang. G-LO: Lightly scented with some honey and citrusy hops. I’m thinking tangerine and a touch of mango. Limpd: Medium mouthfeel and a little creamy. The hops are right upfront but with a mild bitterness and a nice finish. G-LO: Lightly carbonated with a medium mouthfeel. Not particularly sweet, but it has some sweetness which nicely offsets the hoppy goodness. For a session IPA, this stuff is quite robust. Limpd: This was a very flavorful beer. For a session IPA, Iron Hill certainly didn’t skimp on the quality. Refreshing and light, this is a great summertime beer. G-LO: While I was thinking that session IPAs were a bit overdone, the Crusher has proven me wrong. I’d put this on a par with Founder’s All Day IPA. Many thanks to Iron Hill for sending us this sample and to G-LO for his continued hospitality!